The triple top often appears before a big correction or crash in a stock. Which is why it is a bearish reversal chart pattern that you should learn. If a stock is healthy, it should be trending up and making higher highs and higher lows. Instead of going up, the stock just seems to be unable to move past a resistance point. Thus, the stock makes 3 highs at around the same place to form a triple top chart pattern. The inability of the stock to move higher shows us that the bulls do not have the firepower to make the stock go higher. On the other hand, it tells us that the bears are having an upper hand. It warns us that the balance of power is shifting from the bulls to the bear. 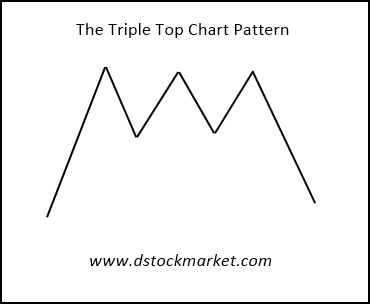 The image above shows how a triple top chart pattern looks like. It looks like a mountain with 3 peaks. The reason why this pattern works so well is because of the failure of the bulls to push the stock higher. Only strong stocks can make higher highs. So, in a way, the triple top warns us of a potential weakness in the stock. Which is why you will often see steep corrections or drops in a stock after the triple top pattern appears. To share with you a live example, I have put the daily chart of CHTR with an annotation above. The stock formed 3 relatively same highs from August to September 2017. By right, if CHTR is a strong stock, it would have gone up higher. When CHTR formed the same highs, it acted as a warning to traders that there might be internal weakness in CHTR. 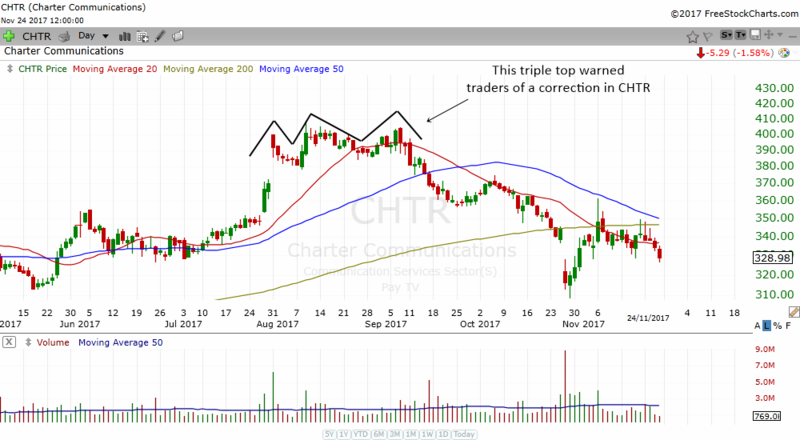 CHTR started to drop below the 20 MA and then it dropped below the 50 MA. Finally, it dropped below its 200 MA. Those who were still holding on to the stock has suffered quite a big correction in this stock. If they had known about this chart pattern, perhaps they would have been able to avoid such a big correction. 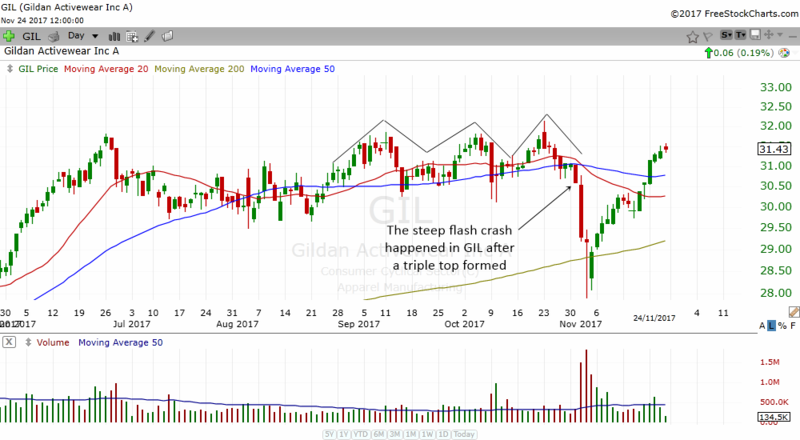 GIL with its daily chart above also shows us how the triple top chart pattern can warn us of a flash crash in the stock. Although there was a peak in June 2017 it is not counted as one of the peaks because it happened quite far away. Triple tops should be made out of 3 peaks that have the same highs and happen quite near in timing to each other. GIL formed another high in September 2017, it corrected and the rise to form another high in early October 2017. It once again corrected and formed another high in mid October 2017 to complete the triple top chart pattern. Immediately after the appearance of the triple top in GIL, a flash crash happen in the stock. Although the stock found support at its rising 200 MA and recovered most of the losses, it could be a heart attack to many investors. Traders could have heed the warning given by the triple top and sold off their shares and find other trading opportunities.